With the Damon® System,treatment time is typically shorter than with traditional braces. Shorter treatment time means fewer appointments and a beautiful smile...faster. You may be surprised at how fast. Straight teeth and a beautiful smile can enhance self-esteem and self-confidence at any age,plus improve overall oral health. Ask your orthodontist how you can benefit from the Damon® System. It's never too late to look and feel great. Introducing Damon® Clear  the passive self-ligating bracket whose beauty is more than skin deep. 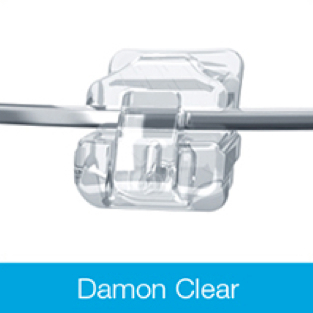 Damon® Clear combines the look and comfort image-conscious patients demand with the strength and functionality discriminating clinicians need. Validated by multi-site in vivo studies and third-party university research, Damon® Clear is more than meets the eye.